We are writing in response to the CBC article that was published on February 06th, 2019 (date mistakenly cited at February 11th in our email). When we were elected to our positions, we all knew that the events and allegations from last year would continue to affect students, the English Department, and the relationships between us. We would like to begin by reiterating that we are in full support of the complainants and victims. SAGE is a student organization run entirely by volunteers and current graduate students, as such our time is limited, and we are unable to devote ourselves to developing solutions. That said, we have included some suggestions and requests below. We would like to express our disapproval at the lack of transparency from Concordia and the Sexual Assault Taskforce that is currently evaluating the on-campus culture. The delayed release of the findings has resulted in the feeling of the University’s complacency and disregard for the victims. Acknowledging the fact that Quebec law currently prevents the transparency we would otherwise demand, we believe that there is more that can be done by the University and the Department to support their students in this uncertain time. We would like to propose a website that will collect all the information that has so far been released to the public in an easy-to-navigate format along with resources for recovering survivors and victims. Clearly outlining the acceptable relationships and interactions between staff and students will allow for strong and navigable boundaries. This can also be used to streamline the process of information and complaints, both of which have been undeniably murky and contentious. Another potential step that has been brought to the Department is a yearly mandatory in-person sexual assault and harassment training. In the effort of good faith, we would like to propose a similar one-day training program for incoming TA’s. Institutions are slow moving, and the high turnover of graduate students and SAGE members can make it feel all the more so. With that in mind, we acknowledge that the process of repairing relationships between students and the department will be a long one. Professors can help accelerate the process by releasing their own statements in relation to their position on the allegations of the last year. We believe that this would be a first step in the direction of rebuilding the trust between students and faculty in the English Department. Finally, we appreciate the statement that was released by the Chair of the Department yesterday and are looking forward to seeing the initiatives implemented. Join us on Friday, September 28 at Kafein, located at 1429 Bishop St, Montreal, for a welcome back party. We will be meeting in the basement near the bar, however, Kafein also has a café located on the upper floor for anyone who wants food or non-alcoholic drinks. Doors open at 7:30 PM. Feel free to bring your partners and besties. Before getting ready to party, stop by the General Assembly on September 28 – Time TBA in LB 646. We’ll be providing an overview of what SAGE has planned for the year and how our finances will be distributed. This is also the time for bylaws to be proposed and adopted/rejected by vote, so do make sure you’re here to have your voice heard. Involvement with Council offers students a direct say in their academic experience at Concordia, as well as the opportunity to engage in dialogue with faculty and administration. For more information about the positions and current members, please check out the team or send us an e-mail at sage@concordia.ca. On September 28, when you join us for the General Assembly and our Welcome Back Party, make sure you take a moment to exercise your democratic right and vote! The 16thannual English Graduate Colloquium at Concordia is presently seeking team members to vet and edit papers and to help manage the event space during our conference on March 23 and 24, 2019, this year titled “Spectral Haunts: Issues of Lingering Pasts and Looming Futures”. The full details of the call can be found here. If interested in the position, please submit a brief paragraph of intent stating why you would be a good fit for the team and detailing which tasks interest you to concordiacolloquium@gmail.comby Monday, October 1, 2018, at 11:59 pm. Headlight Anthology is a student-run literary journal that publishes poetry, prose, and visual art annually in print. We’re currently hiring a managing editor and treasurer. Interested students can send their resume and cover letter to headlightanthology@gmail.comby September 30. The Committee for Equity and Visibility in the Academy aims to maintain an open dialogue between students, faculty, and administration on issues of representation and visibility. If this initiative is something you wish to get involved with, you can contact the organizers at ceva.concordia@gmail.com. That’s it for now! In an effort to ensure that all English grad students receive notice of the goings-on in the department, please keep an eye out for our e-mails advertising the events we put together for you. You can also check out our website, which also boasts a bunch of resources and where we will keep you updated on the election results and events throughout the year. Thanks for reading! If you have any questions, comments, or ideas/projects for the upcoming semester, please don’t hesitate to e-mail us at sage@concordia.ca. We’re happy to hear back about what you want from your department. We are writing in response to the release of the “Consensual Romantic or Sexual Relationships Guidelines” and the announcement of the Task Force on Sexual Misconduct and Sexual Violence. As of January 26th, Concordia has released their Guidelines concerning student-instructor relationships. While these Guidelines were identified by Concordia administration as a key step towards mending the rapport between students, staff, and faculty, they ultimately fail to address the power imbalances of these relationships. It seems like there has been little change to the earlier “Code of Ethics and Safe Disclosure Policy Applicable to Employees of Concordia University” which previously governed these relationships. Those guidelines have already been in place and have failed—and will continue to fail—students. For this reason, SAGE’s current position on relationships between faculty and students is that they are not merely conflicts of interests; they are actually unethical. Secondly, the Guidelines that are provided by the University remain ambiguous in their definitions and descriptions. For instance, in the case of a graduate student who occupies the role of “Instructor,” how would their relationship with a non-teaching graduate student (or “Student”) be interpreted in light of these Guidelines? A similar example would be that of a graduate student “Instructor” who has an undergraduate partner—according to the current wording, it is unclear whether this is a relationship representing a conflict of interest that should be disclosed. SAGE has requested clarification of the terms used in the newly-released Guidelines, in order to accurately reflect their impact on both Faculty and graduate students. Furthermore, the problem areas previously identified and raised by SAGE and CASE, such as off-campus events, remain entirely unaddressed in the most recent iteration of the Guidelines. We are similarly disappointed by the manner in which the Task Force has been deployed. While a unit to address the instances of sexual misconduct at Concordia is welcome, we strongly disagree with the choice of letting the administration appoint the undergraduate and graduate students who sit on the Task Force. The selection process outlined by the call for applications indicates that the student representatives will be selected by the Chair and vice-Chairs of the Task Force. However, we firmly believe that in order to function ethically, student representatives should be elected or appointed by students—not by Concordia staff, faculty, or administration. Additionally, the CSU has made the compelling argument that the selection process as it stands is, in fact, illegal. We hope the University administration will reconsider this course of action. While we desire a timely process, we cannot condone haste at the expense of care and diligence. Thanks to everyone who showed up to the TA Teacher-Training workshop organized by CEVA and the Centre for Teaching and Learning on January 19, 2018. We’ll be writing up some more fully formed thoughts over the next couple of weeks as we process the knowledge and implement some of the practices in our classes, but we want to share the workshop resources with you in the meantime. The workshop slides prepared by Alicia Cundell from the Centre for Teaching and Learning. The Google Doc with all the resources Alicia prepared, the suggestions that came out of the activity, and links to further reading curated by CEVA. If you have resources you’d like to contribute to our bibliography, please request editor access to the Google Doc or send us an e-mail at sage@concordia.ca. On Monday, Concordia alumnus Mike Spry’s “No Names, Only Monsters” drew attention to sexual harassment within the Concordia Creative Writing program. This article came after other claims of gendered violence, including but not limited to Emma Healey’s 2014-article “Stories like Passwords”. The ensuing attention following Spry’s article has result in a response from Concordia University. The University has outlined their process in an address from President Alan Shepard. The investigation will be conducted by a third party hired by the university and will provide recommendations to the University based on their findings. The administration has not yet released specific details of this investigation, such as the investigating party, the specific process, and the timeline. They have confirmed that more information sessions will be held in the coming weeks. We have a number of concerns around the forthcoming investigation which we would like to see addressed. This process has the potential to re-victimize survivors of sexual abuse, harassment, and assault, as well as expose them to new harassment. It is currently unclear how the investigator will accommodate requests for confidentiality and anonymity. We are also concerned about the limited legal and financial resources available to graduate students. For this reason, we are requesting that a legal disclosure form be released prior to the investigation so that we can review it with a lawyer to determine whether it addresses our concerns. This review of the disclosure document will be shared with students. At this time, the courses assigned to the named professors have been reassigned, the books by these professors have been removed from the glass display cases by the English office, and the Department of English is reviewing the location of the Matrix office. We acknowledge the exposure of sexual misconduct will directly or tangentially impact a variety of people in different ways. We would encourage those who need additional support to check out the list of resources compiled by CASE. Many of these resources are confidential and survivor-focused and can help inform those who might be struggling during this time. Finally, we would like to say that we believe survivors of sexual violence and will support you and advocate for you to the best of our abilities. We will be hosting a meeting on Thursday, January 18 at 5:00 pm in LB-659-4 to talk and listen. Provides respectful, confidential peer-to-peer support, advocacy, and resources for those who seek it with a focus on harm reduction, empowerment and self-determination. Provides confidential and non-judgmental support and services to Concordia University students, staff and faculty of all genders and orientations who have been affected by sexual violence and/or harassment. Provides support services for victims and their relatives and close friends throughout the judicial process. According to the individuals’ needs, they may also provide support through health services, group support meetings and referrals to other organizations. 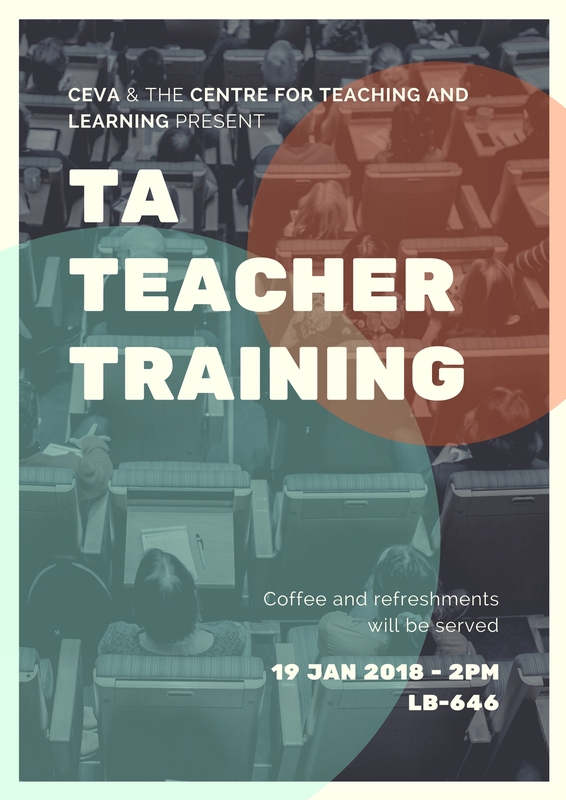 On Friday, January 19, 2018 at 2:00 pm, the Committee for Equity and Visibility in the Academy (CEVA) and the Centre for Teaching and Learning (CTL) are partnering up to present a teacher training workshop in LB-646. Together with undergraduate students, graduate students, and faculty, we’ll be troubleshooting difficult classroom scenarios and workshopping what we can do to make classrooms more inclusive. Even if you don’t hold a TAship for the winter semester, the skills learned in the workshop can be useful in future semesters, and your voice as a student matters regardless of whether you want to teach. Coffee and refreshments will be served. Hope to see you there! Included: Holiday Get Together | CEVA | Advocacy | Headlight | Concordia Colloquium | Misc. Some snow has fallen already. Ice forming under the wheel wells of parked cars. But its a sunny day today. We would like to get together with you sometime next month. Because we would like to see you. If you can’t go to McKibbins, if you have enemies there. It’s ok, we can pick somewhere else. We just need to know. And we’re putting together a Secret Santa so names are important. It is important that you know where you can go if you have an issue. It’s good to know what you can do. Can help you resolve problems conficentially or make a formal complaint? And that you can have your work regraded if you make a named complaint? Or that you should meet with the GSA advocacy centre first? We’ve added this info and links to our resource page. Headlight has its Call for Submissions​. Submit 3 poems or 2000 words of fiction or 3 visual art pieces. We’re looking for editors as well. To get involved. Get involved. Colloquium (Animal Print) has extended the deadline to December 1st. You’ve got half a month. That’s all from us. Cheers! This is what is pertinent to us at the moment. We heard about this through Bonnie. Dr.s Furlani and Languay are hosting the Annual Graduate Party. They’re going to announce who won the department prizes. Come out and congratulate these people. We’re throwing a Halloween Party! Oct 28th. Saturday. 7:30-8pm or so. Sandra’s place is 6652 Rue de Bordeaux. That’s like a 10 minute walk South East from the Fabre Metro. We can can comfortably fit 30 people. We will set up decorations. There are cats. Keep the door closed. Everyone will have a nice time. Candy. Sandra’s spiced wine (Thanks Sandra). Bring stuff too. Pitch in. Be a good guest. Put on a costume. You don’t have to. Kenneth Anger DVD with the sound off. by the end of this weekend. It’s the 16th Annual one of these [Colloquiums]. We have a 400$ surplus from last year. There is an open call for what to spend this money on. We read them in class, and we really liked them. SLS, in connection with its upcoming programs in Georgia (July 2018) and Kenya (December 2018), and in conjunction with Fence magazine, is currently running its 2018 literary contest. Thank you to everyone who voted and everyone who ran in the election. We look forward to working together to bring you exciting SAGE events this year! Nominations for SAGE elections are in. Read up on our candidates below and make sure to vote this Friday, September 29. When I was an undergraduate at the University of Louisiana at Lafayette, I was a part of the undergraduate honors association for English majors titled “Sigma Tau Delta.” Part of my responsibilities was to attend departmental meetings that concerned undergraduates, and as a result, I was able to familiarize myself with the instructors within my department. Also, under Sigma Tau Delta, I shadowed the EGSA (English Graduate Student Association) specifically concerning their organizing the Global South Conference, a local academic conference held in Louisiana. I was then able to see the process of approving papers for presentation at the conference as well as the organization of panels up close. Lastly, I was also a member of the sorority Gamma Rho Lambda, and once a month I attended a meeting with the Student Government Association, an undergraduate organization that involves all student-led organizations to vote on various issues such as funding attendance to conferences for undergraduates, amendments to the students’ bill of rights, and approval for organizations to program campus events. I enjoyed this work as an undergraduate, and I’m excited at the prospect of being an academic representative for SAGE. I believe I will be equipped to handle the responsibilities as a representative from what I’ve done as an undergraduate. I believe I’d be a good candidate because I am very interested in connecting more with the English Department. I want my time at Concordia to be more than just attending class. I’ve been in Creative Writing for a while; I am familiar with the faculty and students, and consider myself friendly and well spoken! I know this position is fairly introductory, still I would want to put my best foot forward and step up to the role. “I lean and loafe at my ease observing a spear of summer grass,” Walt Whitman writes in his poem “Song of Myself,” detailing a languid practice of lazy leaning and loafing. I have all the work-ethic that Whitman lacks in this poem. My passions include: trying to make the world more beautiful and dismantling the patriarchy, both mostly with poetry. I am also reliable, responsible and can write sonnets. I have experience working with similar committees in undergrad (I was an executive member of the Visual Arts Student Association at York University) and after graduation (I was an executive member of The White House Studio Project (artist run centre in Toronto’s Kensington Market)).